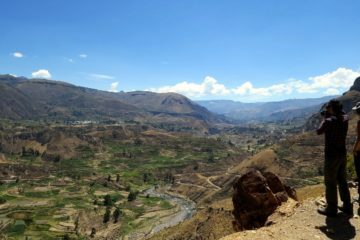 The Colca canyon day trip measures with a depth of more than 3,000 meters, thus ensuring its fame as the second deepest canyon in the world. A natural habitat to alpacas, llamas and condors, its environment presents excellent conditions for hiking, rock-climbing, parachuting and mountain biking. 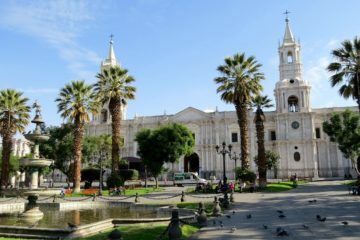 In addition, pre-Inca archeological sites dot its path with tiny colonial churches, thermal springs and a marvelous landscape, all with the possibility of viewing the swooping condors that pass overhead. 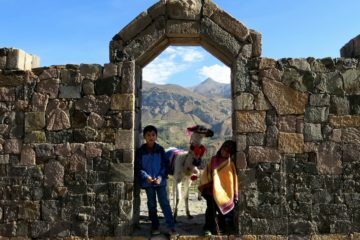 Its moderate climate and altitude make Colca canyon a perfect place to acclimatize oneself before continuing the journey to Cuzco or Puno. In this program our team is in charge of providing all the necessary facilities and requirements to ensure security and a pleasant tour. Very early pick-up to start the excursion at 3 a.m.
Past the snow-capped peaks of Chachani, Pampa Arrieros, Pampa Cañahuas. Then onto the Vicuñas’ National Reserve with an Andean look-out. 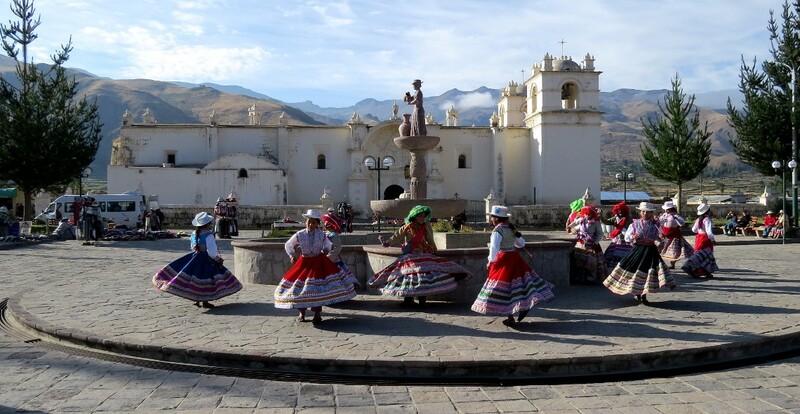 The following is a descent into the Colca Canyon and additional visit to the towns of Chivay and Yanque with it’s monumental baroque style church, Achoma, and Maca, and further on the Antahuilque look-out, the stone model, the hanging tombs, Pinchollo, the valley’s most typical town. Seven kilometres from Pinchollo we come to the Canyon’s Look-Out or the Cross of the Condor where the condor can be observed flying, as well the canyon’s depth: 1,2OO meters from the look-out point to the river. Return to the city of Arequipa at approximately 6:30 p.m. INCLUDED Transportation and excursions included in the program. Entrance fees foreseen in the program. Qualified professional guides trained as group conductors and with great experience in tourism, in English or Spanish.